teacher gift tags: free friday download! How is it August already? The first Friday of every month, we like to offer a little freebie to our loyal readers. 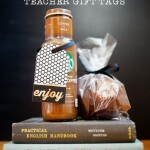 This month, Teacher gift tags!